Finally after days of head scratching and dreaming in database connections, I managed to set up a very very basic web app using Node.js with Express, Mongodb and a bunch of other cool things, all uploaded and connected on Heroku with Mongolab. Don’t be fooled by this graphic – it’s just a mock-up. You can see the actual work-in-progress on Heroku and the git repo is on Github. The app has still a bunch of data modelling to do and I have to code up the app to do what i want in node which is also new to me. Plus I’ve got to do the html and css (which I’m excited about getting around to doing). I was a bit disappointed to be honest that I couldn’t figure out how to connect the very interesting graph database Neo4j. This would have been ideal. After my tutorial with Sam Proud last Thursday and discussing how extensive the project could be – we decided to keep it simple. Just asking people to register their bag of 10 beans in response to a question. 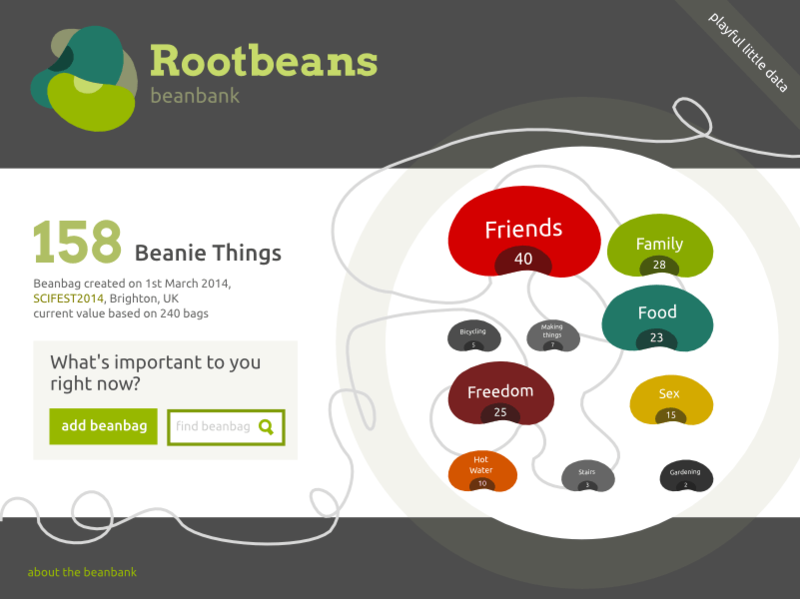 I’m hoping to get the app to add up all the people’s beans that have the same value and as you can see from the mock-up each bag will eventually have a score. I must say though after today i feel very very satisfied with my little dev-opps achievement. I finally feel like I’m getting a hang of Git as well as learning something more about different types of NoSQL databases and Heroku which is pretty interesting too. I’m also aware that the colour scheme and design i have here is a lot more masculine and obviously influenced by the node.js and mongodb websites. I’m hoping that this is a good move. The rootinteractive brand was altogether quite cute and feminine. i’m hoping to attract all kinds of people to take part. I’m getting the shivers, so I hope I can fight off this cold/flu that has floored the other members of my family for the last couple of weeks. If i don’t finish this by mid module presentation on Thursday – I feel happy that I achieved a personal goal and hope Sam and Sue forgive me.